A few months ago I signed a cookbook deal with my publisher for my upcoming book; “Silk & Spice; Recipes from the Silk Road for the Mindful Vegetarian” due out in Spring 2014. As you may have gathered, the book is an ode to my ancestral ties to the Silk Road. You can read more about that in the About Me page and my family history. Since many of the recipes are from my childhood, and most have been modernized to suit my vegetarian lifestyle, my publisher asked me to include photos of my family around food. Old photos, of course. So I plumaged my parents old photo albums scouring for photos. One of the photos was of my Indian nanny growing up, Morris. May seem bizarre that I had a male nanny, but he was not my full time caretaker. Morris primarily took care of my grandfather who lived in Japan. When my grandfather, known as Bobosh, would come to visit us in NY, Morris would come and stay with us for a few months. When I looked at the photo of Morris, standing so proudly like a dutiful soldier, I was pulled back to my memories of him growing up in NY. Morris was a small, dark man that resembled Gandhi, except he had more hair, wore clothes (and not a diaper like Gandhi) and had a little mustache. Morris, was a sweet, quiet Indian Christian with Hindu principles, who was vegetarian. The interesting story behind how my parents met Morris is quite astonishing. When my parents got married over 60 years ago, they lived in Bombay (Mumbai). One night, in the middle of the night, my mother got up from her sleep and walked into the backyard. She saw a little family living there, like the way nocturnal animals do. They simply needed a place to sleep and found refuge in my parents quiet backyard, without my parents realizing it for years. Until….. that one night. Sleeping in the backyard were three cousins: Morris, who would later be my Bobosh’s caretaker and my nanny; Paul, who would later be my father’s bookeeper and Cornelius, who would later be the housekeeper and most of the time DRUNK! My mother accosted these young very skinny men and somehow, in typical Zina (my mother’s name) fashion they became employed. I can tell you that these kinds of stories happened hundreds of times to my parents. If there is one thing I appreciate about them is that they are open to all opportunities and cultures. As a child, I remember Morris helping my mother cook all the traditional Bukharian dishes which consisted of meat, in spite of him being a vegetarian. He cooked meat like nobody’s business. How?…. I have no idea. Typically the help in my parents house would eat the food that was being prepared, but Morris could not eat any of the food. He would quietly make a simple vegetarian Indian dish for himself, while he was stirring my mother’s pots. The one dish I remember Morris cooking for himself was this Curried Cabbage. I am not sure why I recalled this dish out of all the foods he prepared. I think because when I was a kid, I was thinking at the time, who eats cooked cabbage as a meal? As a child, I suppose those kinds of foods were unthinkable to me. Now…. it’s the norm! 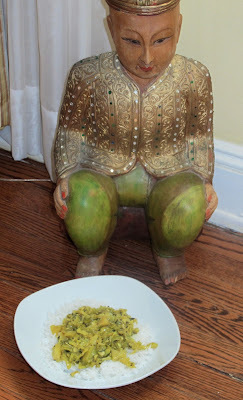 So here is the Curried Cabbage that Morris made and has become one of my favorite dishes. First off, it’s so easy to prepare as this humble cabbage gets transformed into a delectable dish flavored with fresh coconut and some hot chile. A food fit for a Hindu Prince. 1. Wash the finely chopped cabbage in salt water and then soak for 5 minutes to remove any debris and bugs. 2. In a saucepot, heat coconut oil over medium heat and add the mustard seeds and wait until they splutter. Then add the green chilie, curry powder, and turmeric powder. Add the cabbage and mix well. Cover it with lid and let it cook in its own juices for about 15 minutes or until the cabbage becomes transparent. 3. Once cooked, add the grated coconut, cilantro, sugar, lemon juice and salt. Serve with a side of Basmati rice. I have been out of commission for the last 2 weeks. Not by choice… actually I had no choice, no power, and no heat due to Hurricane Sandy. I am sure you have heard of this notorious hurricane that moved slowly across the eastern seaboard only to collide with a No’easter. Long Island was in the dark. It knocked nearly all electric out for 2 weeks. While I am grateful, we got the power restored and my home is intact, during that entire time I did not cook. So, my diet was a bit haphazard due to my disorientation of this whole ordeal. My CSA along the eastern tip of Long Island somehow managed to deliver fresh produce to my garage, which is the central depot in my area. Their thinking was that so many people who like me were on a poor diet for the last 2 weeks could use a boost of healthy organic produce. They were right. 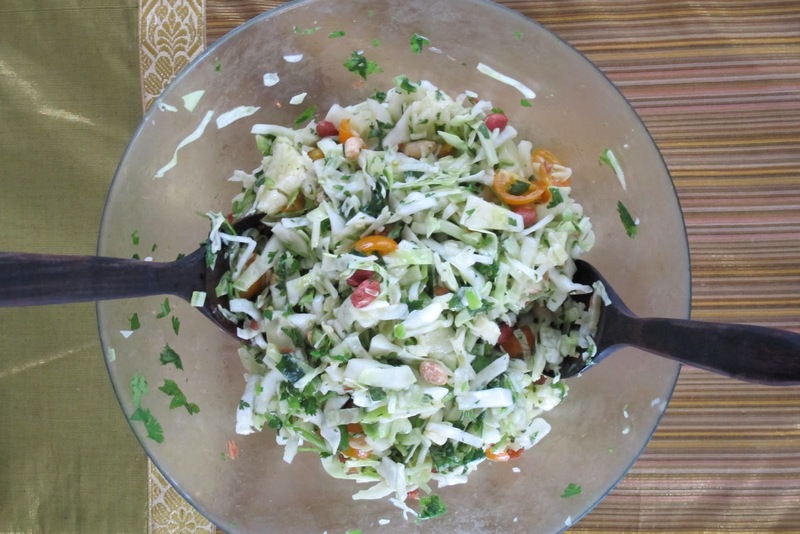 So this week, among the wide assortment of vegetables, I made this quick and easy salad made from cabbage and cilantro. 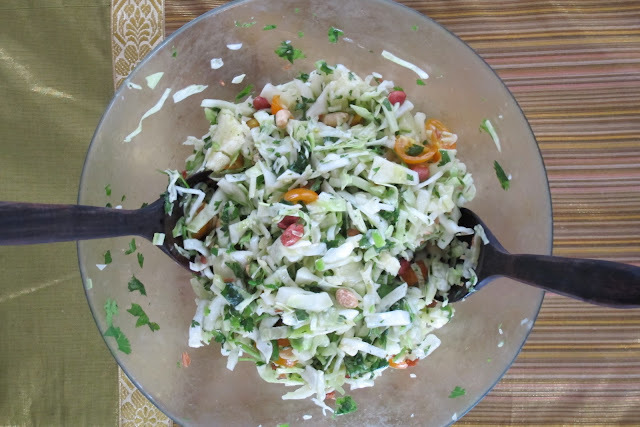 It’s Indian inspired and in South India, they eat a variation of this salad cooked. If you though that coleslaw was a german side to a tripple decker pastrami sandwich, know that the Indians thought of it first. The easiest way to cut up cabbage is to cut it up into cubes and then toss in the food processor to grate. If you don’t have a food processor, you can always practice your knife skills slowly and methodically cutting the cabbage into fine ribbons. In a skillet or oven (350F) roast the peanuts for 5 to 10 minutes, shaking the pan once or twice along the way, until golden and toasted. Cut the cabbage into two quarters and cut out the core. Using a knife shred each quarter into whisper thin slices. The key here is bite-sized and thin. If any pieces look like they might be awkwardly long, cut those in half. Combine the cabbage, tomatoes, jalapeno, and cilantro in a bowl. In a separate bowl combine the lime juice, olive oil, salt. Add to the cabbage mixture and stir to combine. Just before serving toss in the peanuts to retain their crunch. Taste and adjust the flavor with more salt if needed. The name of this salad is actually called Ying Yang Salad with Peanut-Sesame Dressing from the Real Food Daily Cookbook. I’m going to provide a link over to 101 Cookbooks for the recipe, since Heidi Swanson reprinted it with permission, which I don’t have. The reason it’s named such is because it is an homage to the ancient Chinese philosophy that all things in the universe contain elements of both yin and yang. The philosophy of yin and yang lies at the heart of Chinese culture. The first reference to yin and yang come from the classic works of Confucius. Taken literally, yin and yang means the dark side and sunny side of a hill. People commonly think that they are opposing forces, but in fact they are complementary pairs. In Yin and Yang cooking there is always a balance in color, flavors and textures. The challenge is to consume a diet that contains the balance between the two. The crunchiness and coolness of the cabbage and carrots are the perfect counterpoint to the rich and creamy peanut dressing. Toss the cabbage, carrots, radish, and green onions in a large bowl with enough dressing to coat. Mound the salad into 4 wide, shallow bowls or onto plates. Arrange the tofu around the salad. Sprinkle with the sesame seeds and serve. Blend the peanut butter, vinegar, maple syrup, water, tamari, ginger, garlic, sesame oil, and crushed red pepper in a food processor until smooth and creamy. Add the cilantro and blend just until it’s finely chopped The dressing will keep for 2 days, covered and refrigerated. Drain the tofu and save the containers. Cut into 1-inch wide strips, and pat dry with paper towels. Cover a large baking sheet with more dry paper towels. Place the tofu in a single layer over the towels on the baking sheet and let drain for 2 hours, changing the paper towels after 1 hour. Whisk the soy sauce, vinegar, sesame oil, garlic, and ginger in a bowl to blend. Pour half of the marinade into the reserved tofu containers. Return the tofu slices to the containers, and pour the remaining marinade over. Cover and refrigerate at least 4 hours and up to 1 day. Preheat the oven to 400’F. Oil a heavy, rimmcd baking sheet with the canola oil. Drain the tofu and place it on the prepared baking sheet. Bake for 10 minutes on each side until golden brown and heated through. Serve warm or cold, or at room temperature. The tofu will keep for 1 day, covered and refrigerated.